M.Phil/Ph.D/NET/SET/SLET with 55% of marks in Masters Degree they are eligible to apply for these Assistant Professor jobs of Sikkim Government Colleges. Last date to reach the filled application form for this Sikkim PSC Asst Professor jobs are 11-11-2017 by 03:30 PM. Application form is available for download @http://www.spscskm.gov.in. Candidates will be selected on basis of merit and personal interview. 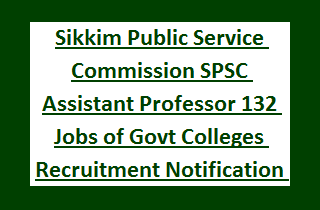 More information of SPSC Sikkim Govt Colleges Assistant Professor jobs age limits, qualifications, salary, application form submission procedure and other details are given below. Last date for submission of application form for this SPSC vacancies is 11-11-2017 by 03:30 Pm. There are total 132 vacancies in this Sikkim PSC HRD Recruitment for Govt Colleges for 16 subjects. Candidates must have crossed 21 years of age and within 40 years of age as on 30-09-2017. Candidates must have qualified Masters Degree with an aggregate of 55% and for SC/ST candidates 50%. And NET/SET/SLET/Ph.D/M.Phil qualification is required. Selected candidate will received the monthly remuneration of Rs.15600-39100 with GP of Rs.6000/-. However in probationary period remuneration will be as per the HRD norms. Based on received applications candidates will be shortlisted as per the merit in qualifying examination and interview. Download application form from official website of www.spscskm.gov.in. Fill the details clearly and attach the necessary documents. Last date to reach the application form to Sikkim Public Service Commission is 11-11-2017 by 03:30 Pm. (3) Certificate of SLET)/NET/SET or Ph.D or M.Phil.